When the Moon is aligned directly in between the Sun and the Earth, it obscures all or part of the sun to an observer on the ground. When the Moon is aligned directly in between the Sun and the Earth, it obscures all or part of the Sun to an observer on the ground. A total solar eclipse happens about once every 18 months somewhere on Earth, partial eclipses more often. By a happy coincidence of size, the Moon is just the right size to obscure the disc of the Sun in a total eclipse. 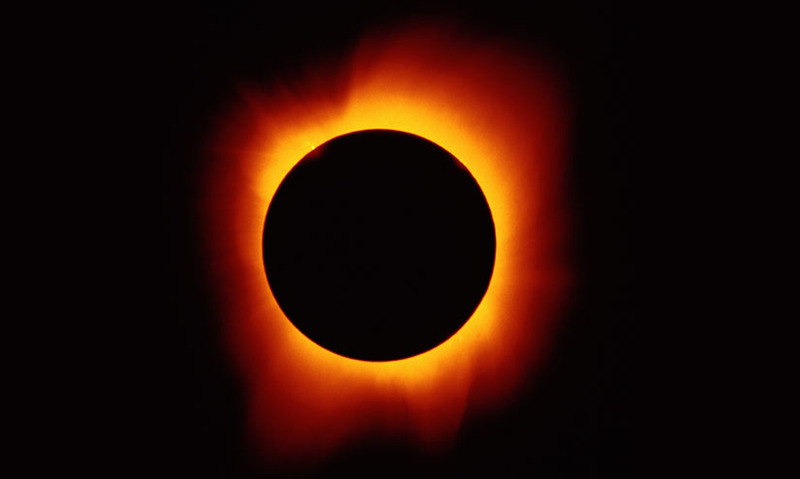 A total solar eclipse happens about once every 18 months somewhere on Earth, partial eclipses more often. By a happy coincidence of size, the Moon is just the right size to obscure the disc of the Sun in a total eclipse.